Ten years ago, the Marcoot sisters would probably have told you there was no chance they'd devote their lives to cheese. As teenagers, sisters Amy and Beth had been sat down by their farmer dad and told his expectations for them in no uncertain terms: “I don’t want you coming back to the farm." He advised his daughters to do what they wanted in life rather than feel they were bound to their ancestral homestead in Greenville, IL. Thankful for the lack of pressure, Amy went for her master’s in counseling, Beth became a licensed therapist, and everything was fine -- until their mom called one day and mentioned their dad was planning to sell the farm. When the reality hit that their seventh-generation dairy farm was about to pass out of their hands, the women realized they wanted to not only preserve the family’s legacy -- but make production sustainable while keeping it profitable. Funny enough, holding themselves to a higher standard led them to invent a best-selling dessert... but first, they had to responsibly reinvent their work process. Even though they both grew up with plenty of farm know-how, the sisters knew that revamping the farm would be no small task. If they were going to innovate new means of production, they would have to turn to another childhood friend for help. Audie Wall had grown up on another farm down the road, and also attended the University of Illinois with Beth and Amy. She was now pursuing her own “normal” life -- as an engineer and professional helicopter pilot. But she was down to join her friends on this venture, and volunteered her analytical skills. After considering their options, the three struck upon cheesemaking. Wall wasn’t a trained cheesemaker, but she brought two important ingredients: “The scientific method and gumption,” says Amy. 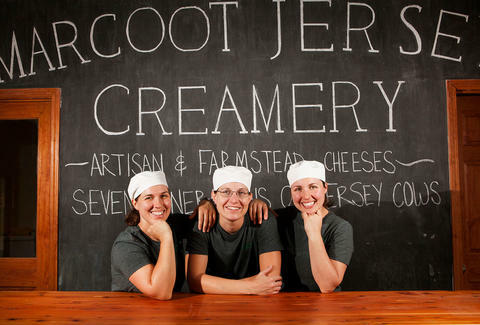 Deciding to put their other occupations on the back burner, the women hashed out a plan -- and in 2009, The Marcoot Jersey Creamery was born. It’s not just the quality of their cheese that sets their dairy apart. It’s how they make a lot with a little. For example, one of the creamery’s most notable features is its underground, Swiss-style cheese cave used to age their wares “while providing energy efficiency and sustainability for the creamery.” By using a method that predates a need for power sources, they’ve found a way to lower their carbon footprint (and electrical bill). That’s what you call good engineering. But it’s not the only Swiss import they’ve built their business on in America. 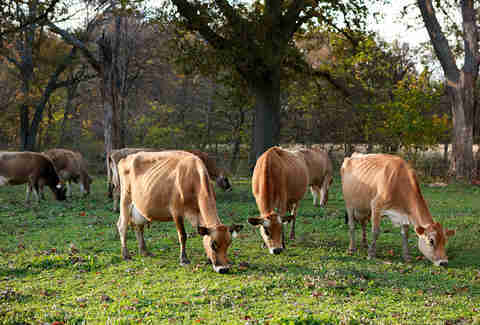 Jersey cows (meaning the famous brown variety, not a breed actually from the Garden State) had always played a part in the family history. In 1842, their ancestors had put their belongings on a boat and sailed to the new world from Switzerland -- belongings that included the family Jersey cow. A couple hundred years later and the descendants of both family and cow were still working together on the farm. And share they do. Through tastings, pairings, and both guided & “hands-on” tours, the group makes good on its promise to “provide experiential education to our guests.” The process of cheesemaking has been a massive educational experience for the Marcoot team -- and they want to make sure they pass that along to anyone who wants to learn. Guests and visitors can look into both the milking parlor and the cheesemaking facilities so that they can see the process at every step… and maybe get inspired to become future dairy farmers. The Marcoots produce a wide array of cheese products at the creamery, from fresh mozzarella to their signature cave-aged tomme (a mild, semi-soft cheese), but all showcase their serious traditional cheesemaking chops. 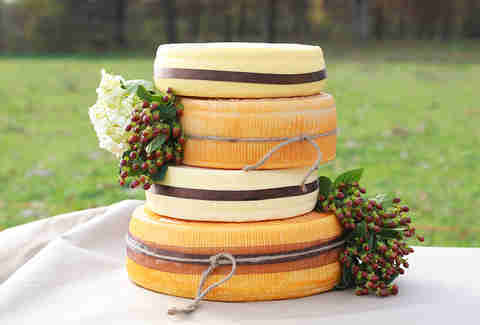 Yet where these farmers truly shine is their innovation beyond the conventionally accepted process of cheesemaking. In one of their most ecological and economical moves, Marcoot turned whey byproduct from cheesemaking into a best-selling frozen dessert high in protein and devoid of added sugar. Wall had often wondered if there was something to be done with all of the whey they produced at the farm. A natural byproduct of cheesemaking, whey was being used to supplement the diets of their heifers -- certainly a sustainable practice. But the creamery still needed a little oomph to keep itself going, and she wondered if there was a way to turn this byproduct into a product. Plenty of creameries in states like Wisconsin have commercial facilities to process whey, but southern Illinois did not offer such possibilities. Dehydrating it themselves was prohibitively expensive. Using it in the production of beer, wine, or dog food were all feasible -- but probably not going to be big hits. That’s when Wall tried freezing the high-protein whey with crushed fruit and ice, to delicious results. 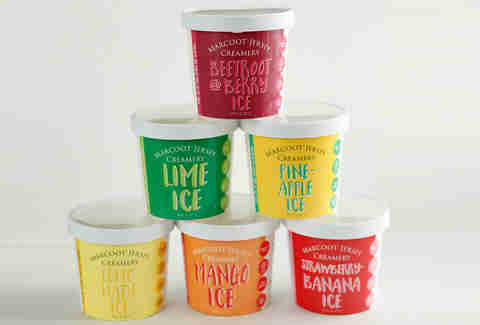 All it took to invent whey ice was a little culinary experimentation and the attitude that even “waste” can have a use. In cheesemaking, the amount of whey produced is almost equal to the weight of the milk that the process starts with, meaning Wall and the Marcoots could make 1.7 million pints of their frozen whey treats per year. They’ve begun selling it on their website and in local grocery stores, but are certainly looking into even more growth for the unique treat. They’re even working with some universities and major league teams on the possibility of a high-protein version of the whey ice for athletes. It goes to show, when you go away from something for a little while but keep your passion for it, you come back with fresh eyes. And if you’re willing to experiment, you can create something that just might revolutionize the entire process. Might the Marcoot Creamery have innovated its whey treats if the sisters had simply inherited the farm? Perhaps. But by realizing what they almost lost, they were willing to make big changes to preserve its best parts. And that, in turn, led them to discover something new and wonderful. To read more stories of dairy devotion, including those devoted to responsible production, head to UndeniablyDairy.org/devoted.